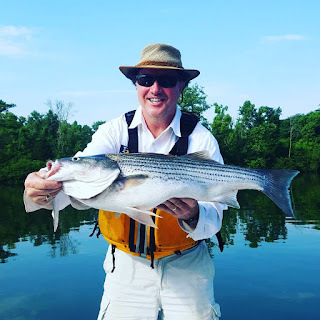 THIS 12LB + FRESHWATER STRIPED BASS -- was the work of JOE FORE putting me "on the fish" with his HOME-MADE special invention of a FLY to imitate a SHAD (baitfish). Very rewarding to be with a guy that really knows his stuff... and has the passion to deliver. Double Haul Casting an 8WT sinking line with 20lb leader / tippet is the call for this kind of fishing!!! Get the grease out for your shoulder joints and GO FOR IT.